Arkansas Flag Company Notices U.S. flag in high demand despite ‘kneeling’ trend before football games. 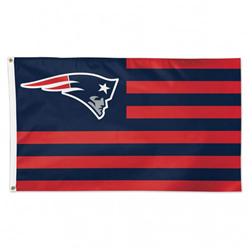 Officially licensed New England Patriots Americana Flag. FlagandBanner.com sells many NFL sports flags this time of year, but in recent weeks it has seen an uptick in U.S. flag sales in response to an increase in kneeling protests from NFL football players and other athletes. Flag and Banner began in 1975 as Arkansas Flag and Banner and is based in Little Rock, Arkansas. For more information about U.S. flag sales during periods of political controversy, or to schedule an interview with Flag and Banner owner, Kerry McCoy, call (501) 375-7633.